"This is a tart, tasty lemonade with a sweet kick, perfect for the cook with garden access during the summer months. You'll need a blender with a 'puree' or 'high pulse' setting. Garnish with any leftover strawberries." Place strawberries in a blender; top with 2 tablespoons sugar. Pour 1 cup water over sugared strawberries. Blend until strawberry chunks transform into juice. 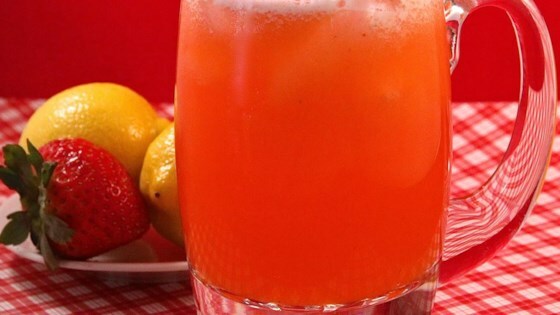 Combine strawberry juice, 6 cups water, 1 cup sugar, and lemon juice in a large pitcher; stir until blended. Chill before serving. This was gross! Couldn’t taste strawberries or lemons! Tasted like water with chunks. We put 10 lemons in and still didn’t get a good taste based on what the recipe said to do. This sucked! It was super good. I made it for my sister and her friend and they loved it. I would suggest using 10 strawberries instead of 8. It gives it a better taste.